Are you ready to start a blog for your Optimist Club? Blogging is a fun and easy communication tool. The district has reserved blogspot names for every club in our district. Please send the communications team a message and get started on your blog today. One of the Salem Optimist Clubs signature events is the Kids Relays, a one-day field day that they organize with the Salem Parks and Recreation Department. When other groups backed out of the event in recent years, the Optimist Club was there to take up the slack and ensure that the event went on as planned. This year they are proud to announce a presenting sponsor for the event: Country Financial. The event will now be known as the Country Kids Relays. The team effort will continue with the City of Salem and the Salem Optimist Club. Country Kids Relays will be held on May 8, 2010 at he Willamette University McCulloch Stadium. Find out more at the Country Kids Relays website. The Meridian Optimist Club is making preparations for the pre-qualifying tournament for the Optimist International Junior Golf Championships in the PNW District. Every Optimist Club may send golfers to a District Tournament; there are no prerequisites or pre-qualifying tournaments needed. Golfers may also choose to play at large without club sponsorship. 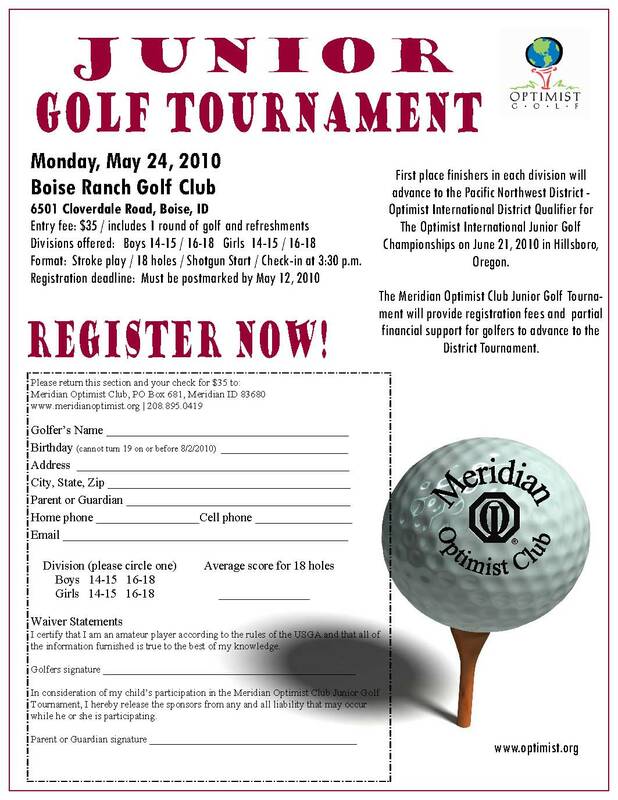 However, in 2009 the Meridian Club decided to provide an opportunity for young golfers to play closer to home, practice, and compete for bragging rights as well as the opportunity to move forward with sponsorship from the Meridian Optimist Club. In order to fit into the Optimist Junior Golf Championship schedule, the tournament is considered a pre-qualifier. 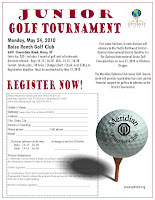 The Meridian Junior Golf Pre-Qualifying Tournament will take place at the Boise Ranch Golf Club on May 24, 2010. Click on the picture to enlarge and print your entry form or download here. Find out more about PNW District Optimist Junior Golf Tournament. Promise yourself to be lucky! Need a little extra cash around tax time? Then you should join an Optimist Club in the Boise Valley. On Wednesday, April 14, both the Caldwell and Meridian Optimist Clubs had lucky winners drawn in their progressive membership drawing. Anita Welchel, president-elect was the lucky winner in Caldwell and in Meridian new member Mel Landaluce pocketed a quick $185. The drawings are fundraisers for both clubs with proceeds going to offset such things as speakers, visitors and guests meals. The raffle can sometimes run for a nearly a full year before a winner is drawn. Congratulations ladies! 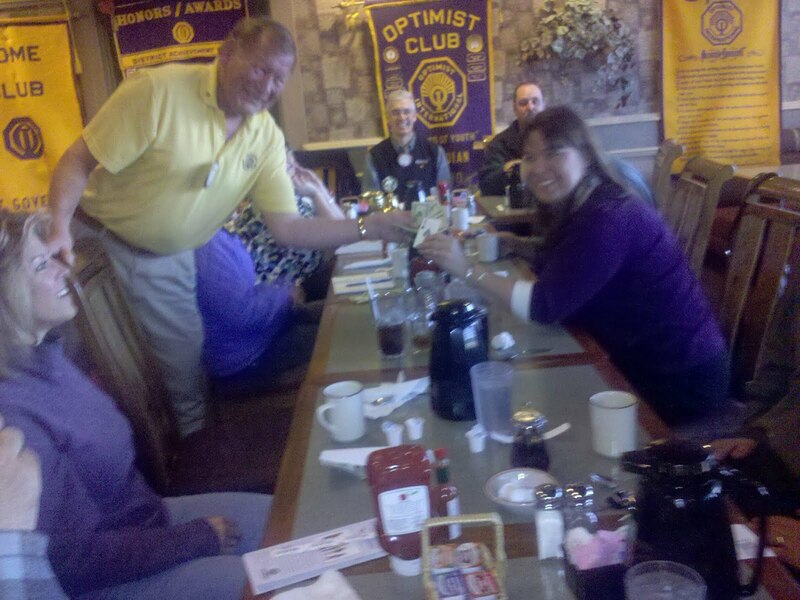 Club secretary-treasurer Bill Garcia "pays off" Mel Landaluce at the Meridian Optimist Club meeting. The system that Optimist International has in place with online reports is awesome! Every time a club makes a roster adjustment (CRA) online, I get an alert in my inbox. Not only do I get the alert, but the information is then placed in a spreadsheet that I can access online. So if you add a member, delete a member, or update a member's contact information with Optimist International, all of district leadership has that information at their fingertips immediately. The same is true when you file your Club Officer Elect Report (COER) and your Presidents Pride Report online. This means that we no longer need to maintain multiple databases. With such a useful resource in place, it makes sense that we use it. One of the primary reasons that we pay membership dues is so that the organization can provide member services. Membership maintenance is the most basic of all services. If the organization cannot communicate with its members, there is a problem. Thank you for joining and thank you to their sponsors for helping the Lebanon Optimist Club provide more service to more children in their community. And thanks also to Optimist International for allowing me access to the online membership database and reporting system. Optimist Clubs are still my favorite thing! At the halfway mark of the year, I want to take a moment to say thank you to all of the great Optimist Club and District leaders and Optimist Club volunteers that we have serving our communities in the Pacific Northwest District - Optimist International. It's because of you that Optimist Clubs are my favorite thing. I am happy to report that we are growing, both in number of members and in projects. One look at this blog tells you that our Optimist Clubs are engaged in communities. There are community service projects, Optimist International programs, club events and celebrations highlighted, several new ideas each week. Like all districts and all service clubs, our membership is up and down. The loss of Meadow Ridge, BC, Coos Bay and Ontario, OR clubs are difficult membership losses to overcome. But the Optimist Clubs of Mason County, Pasco Tri-Cities and Caldwell are trying to make up for those losses and then some. They have each added more than ten new members this year. A number of clubs are right on track to be recognized as Honor Club. In fact, every club still has the opportunity and ability to earn that distinction. What does it take to be an Honor Club? Membership growth - Clubs with up to 74 members must have a net increase of 5 members. Clubs with 75 or more members must show a net increase of 1 member. Finances - District and International dues must be paid by September 30, 2010. Service Projects - Club must complete 3service projects (verified by the District S/T) and submit at least one CPA book to Lorraine Coots, Membership Retention Chair by September 30, 2010. Club reports - Officer-elect report must be submitted by May 20, 2010 and the President's Pride Report must be submitted by September 30, 2010. Both may be completed online. Please call me at 208.861.2310 if you need help navigating the online system. 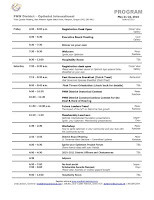 Attendance at District Meetings - Club president or Board member must attend 50% of all District meetings and be verified by District S/T as being present. Being recognized as an Honor Club is a way to say thank you to your club members for the work they do every year. It is a little gesture that signifies your Optimist Club is serving your community with the intention to be around for many years to come. An Honor Club replenishes itself with members, is financially sound and is conducting programs that make a difference in their community. It is an honor to be Honor. As we look forward, we have some exciting activities in store. On May 21-22, we will gather in Newport, Oregon for our Third Quarter District Meeting where we will be wowed by our Oratorical and CCDHH Contestants. Our district training team will be back with great membership and leadership ideas and we will elect our lt. governors for 2010-2011. It's a time for celebrating our past, present and our future. But before we arrive in Newport, your Optimist Club will have elected new officers for the coming year. 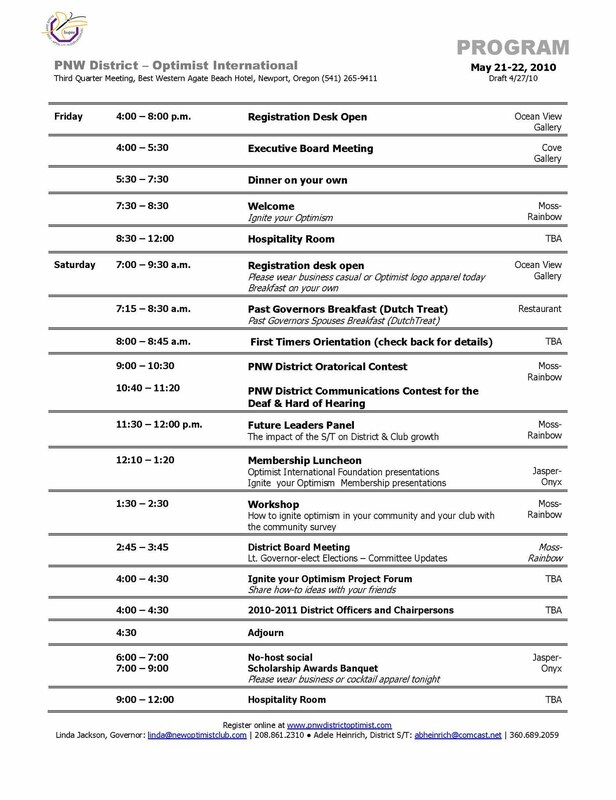 Please be sure to submit your club officer-elect report online by May 20 and bring those newly elected officers and board members with you to the meeting so they can begin to develop plans to lead in the coming year. More than 400 people turned out to see 22 acts as they sang, danced and played with poise and grace well beyond their years at the 2nd Annual Burnaby's Got Talent. The winner in the junior category was Jahlil Dulay and the overall winner was Antonio Larosa. They are shown in this picture with Richard Lee, member of the Legislative Assembly for N. Burnaby. Congratulations to the Burnaby Optimist Club and Burnaby's Got Talent Coordinator and Chairperson Cathy Cena for a fantastic event. 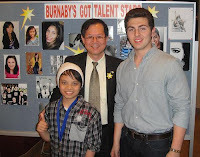 The 2nd Annual Burnaby's Got Talent was recorded by British Columbia photographer Angelo Cikes. Looking through his lens at the events of the evening is truly delightful. Please visit his blog to see the photos. Visit Angelo Cikes blog. I'll try to keep up when he posts additional pictures and link to them here for you to see. It was cold and snowy, but nothing could hold back the enthusiasm of the Jerome Optimist Club for sharing Easter with the children. There were plenty of eggs for all as about 250 kids scrambled to find the camoflauged eggs that gave them an extra prize. Meet the finalists in the Coquitlam Optimist Club Essay Contest (left to right): Jenny Tan, second place; Michael Nadolny, First Place; and Andy Tan, third place. Please read about the contest at the Coquitlam Optimist Club blog.